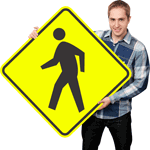 Buy an official Railroad Crossing Sign. 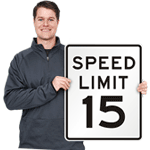 This is the top selling Crossbuck signs in the US. 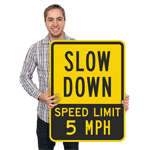 These are the same Crossbuck signs that we sell to 100’s of state, utility and local agencies each year. With over 10,000 sold, most freight companies in the US specify our design. Innovative “Dogbone” metal extrusion is practically inflexible, ensuring that your sign does not twist or bend in the wind. Standard metal backings often fail in gusts. 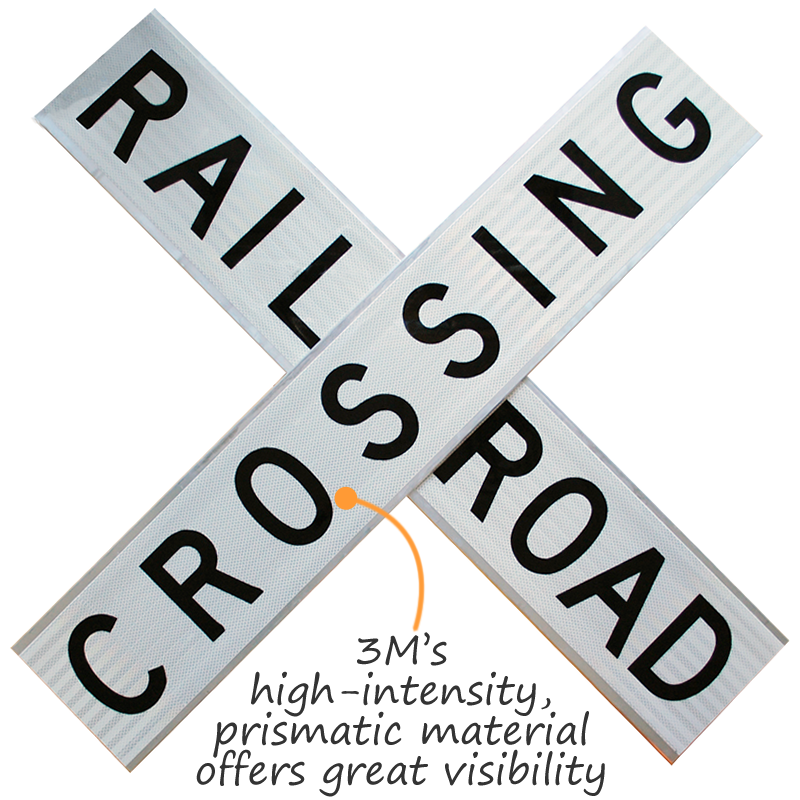 Signs use 3M matched component inks, films and metal. We recommend High Intensity Reflective film – for enhanced visibility. Signs are also available with High Intensity Prismatic (HIP) reflective strips on the backside, which enhances visibility from the other side of the track at nighttime. 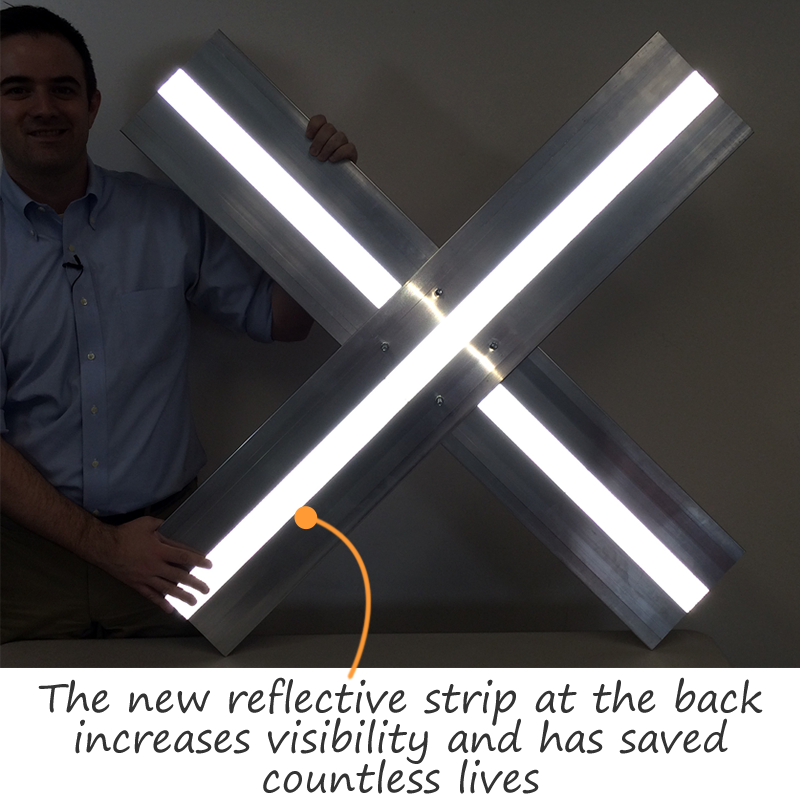 80 mil, HIP reflective for railroad crossings. 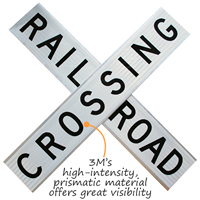 Screen printed with 3M match component inks designed for traffic and railroad sign materials. Resists chemicals, water and abrasions. 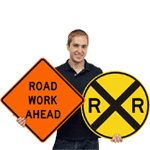 Backside Reflective Strips Most railroad signs use reflective strips on the back. Over 50% of nighttime collisions between automobiles and trains result from drivers mistakenly thinking that the way across the tracks are completely clear. Driving directly into the path of a moving train is deadly. 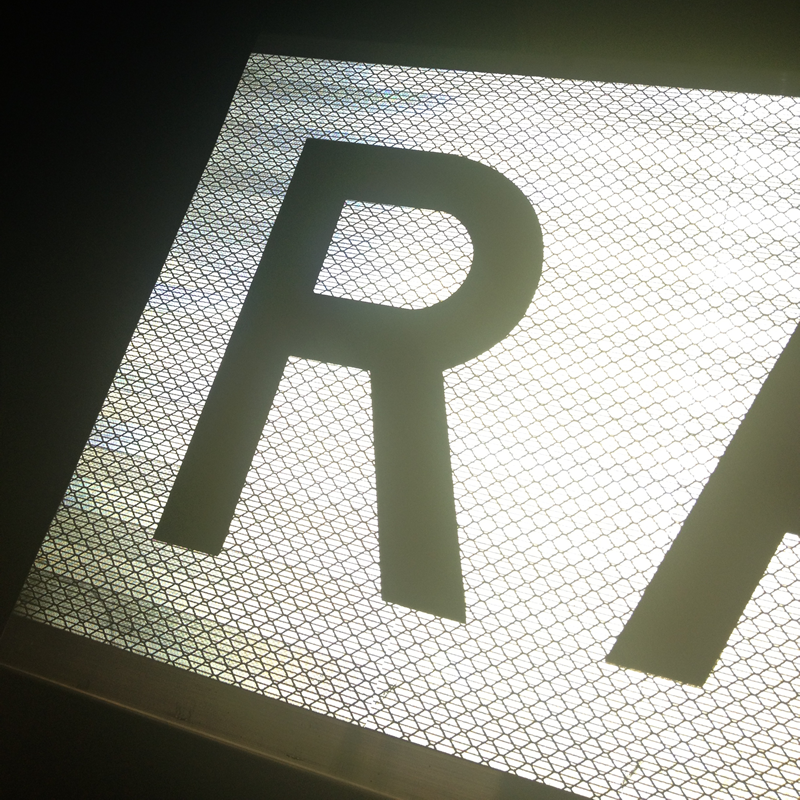 When reflective sheeting covers the back of the crossing sign as well as the signpost, headlights from a car brilliantly illuminate the sign on the other side of the tracks . Light shines back in the eight foot gaps separating each passing train car. This creates a strobe effect . After becoming law in many states, these strips have saved countless lives. Just now opened up the packages and they sure do look good and will be a welcome addition to our railroad. I did not open up all boxes though and have to say that the carrier did not treat them well. If there is a problem when all four are opened I will advise. RoadTrafficSigns: Thank you for your order. We appreciate your feedback. Very good quality. Fast shipping. Father was a railroad-er for 42 years. The real deal, but does not come pre-assembled or with assembly hardware. This sign is well built, it's not a replica it's an actual DOT approved regulatory railroad sign in use by railroads across the country. The 48x9 I ordered came in a timely manner, it was exactly as advertised. 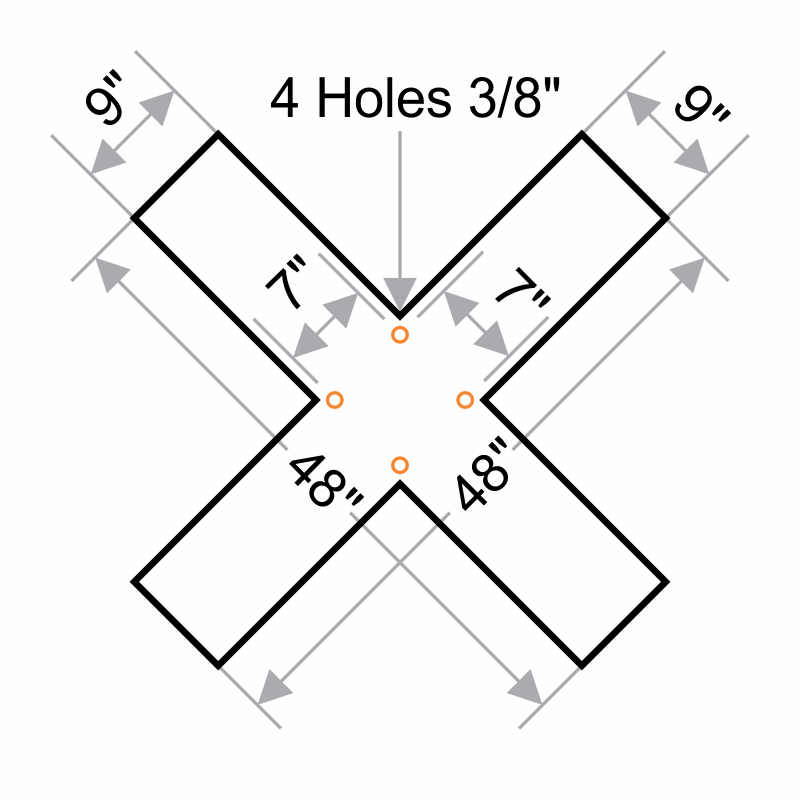 It does NOT come assembled, and it does not come with hardware to put it together, but four 1/4 inch bolts, washers and nuts will certainly do the trick. It weighs around 8-10 pounds but feels a bit heavier. 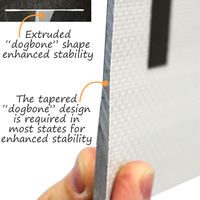 It's sturdy aluminum and the material is highly reflective and in compliance with all associated regulations. 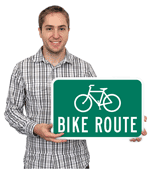 The adhesive material on the sign face itself covers the holes where you insert the bolts to put it together, but cutting out the hole from behind using a sharp razor knife does the trick. I bought one for decoration as a railroad enthusiast and I am not disappointed. The signs were delivered very promptly and they were exactly what we wanted and expected.